Charice, We are Proud of You! Charice Pempengco, David Foster, Celine Dion, and Andrea Bocelli in the Oprah Show. I'm so proud to be a Filipino watching this special Oprah show featuring Charice. Congratulations! Awesome Sale That I Don’t Want You To Miss! I just came from the Ultimate Ilocos Norte Trip which included surfing sessions in Blue Lagoon. While I’m getting back to the blogging grove again, I don’t want you to miss five (5) four (4) awesome sale events that are happening in Manila this coming week. What Makes it Awesome: This is where you can get the cheapest airline tickets, and hotel rates you can use for 6-12 months. What Makes it Awesome: Otherwise known as the Bulacan Sale that only happens 3x a year. This is the best and much anticipated factory sale event in Manila. This is where we buy cheap fashion branded clothes. Date: September 12— 16, 2008 10:00 A.M.— 8:00 P.M.
What Makes it Awesome: This is where you can find really good books at a good price. What Makes it Awesome: This is where you buy Oakley from the distributor sale. What Makes it Awesome: Fashion Brands Sale. We will check this out this weekend. Click here for the full Meralco Theater Seat Map Version. The most frequently asked question when buying West Side Story tickets is what is the best seat to buy. This is a matter of preference based on eyesight, company, status, and budget. Most of the views are generally OK for me except for the extreme A334 in Orchestra Left and A101 in Orchestra right which have a blind side. As an OAP exclusive, here are the different views of Meralco Theater based on the highlighted seats in the West Side Story seatmap above. Enjoy! You will fall in love with the romance between Tony and Maria. I’m sure everyone can relate to Tony’s struggle of loving Maria with a different cultural background. Tony is American and belongs to the Jets while Maria is Puerto Rican and belongs to the Sharks. I’m sure that the people who submitted entries to the Most Romantic and Most Tragic love story ever blogged would be able to relate. Also, the dance fights between the sharks and jets are engaging and fun. It has a variety show production appeal with a broadway twist because they have to sing, dance, and act at the same time. I wanted to give a standing ovation to the AMERICA and GEE, OFFICER KRUPKE! dance performances. There are three technical rehearsals before the opening night on Sept. 5, Friday. The first one was held last tuesday for the Meralco employees, last night was for the press and tonight is for ABS-CBN. Also, there are two good versions of the show, the Joanna Ampil version and the Karylle version. We watched last night’s Karylle’s version of West Side Story. The Karylle West Side Story version is fresh and entertaining in a showbiz kind of way. What I love about her version is the chemistry between Tony and Maria. They both share the same vocal range so their voices blend perfectly well. Karylle’s and Christian Bautista’s version of TONIGHT and SOMEWHERE are memorable and you can’t help but fall in love with the characters. Chocolate Stars and Sapphire Dreams’ The Best Night of My Life. Like it Or Not’s The Last Quarter of 2004. Thanks for sharing your detailed tragic love story via email. We really appreciate it. Congratulations! Email me at [email protected] to arrange for the shipping of your prizes. The hottest restaurant in Makati these days is in the corner of Perea and De La Rosa St. in Makati. Barely a month old, Mom (Belen Vergara Torres) and Tina’s (Torres-Santos) Bakery Cafe is creating an unstoppable foodie buzz and long queues during lunch time. I’ve never seen such excitement and warm welcome for this Bakery Cafe originally based in Ortigas. Mom and Tina’s formula for success is simple. 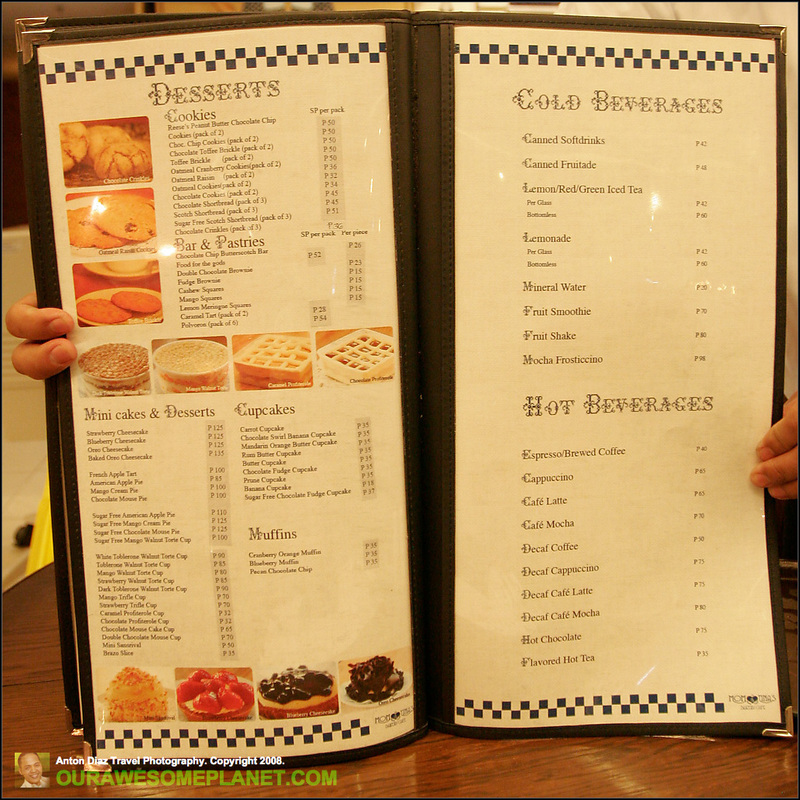 They promise to serve home-cooked meals with fresh ingredients and fresh-from-the-oven pastries and baked goodies. I was pleasantly surprise about how affordable gourmet food is in this cafe. 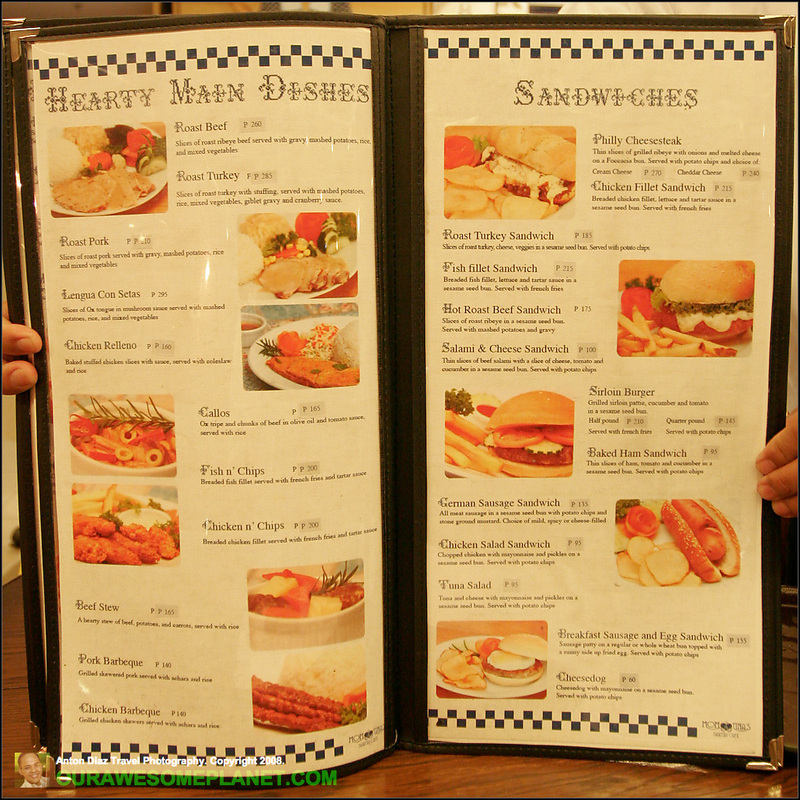 The cafe can accommodate roughly 100 people and opens daily (10am to 11pm at night). This is a favorite hangout for late night dinners or weekend hangout in Makati. 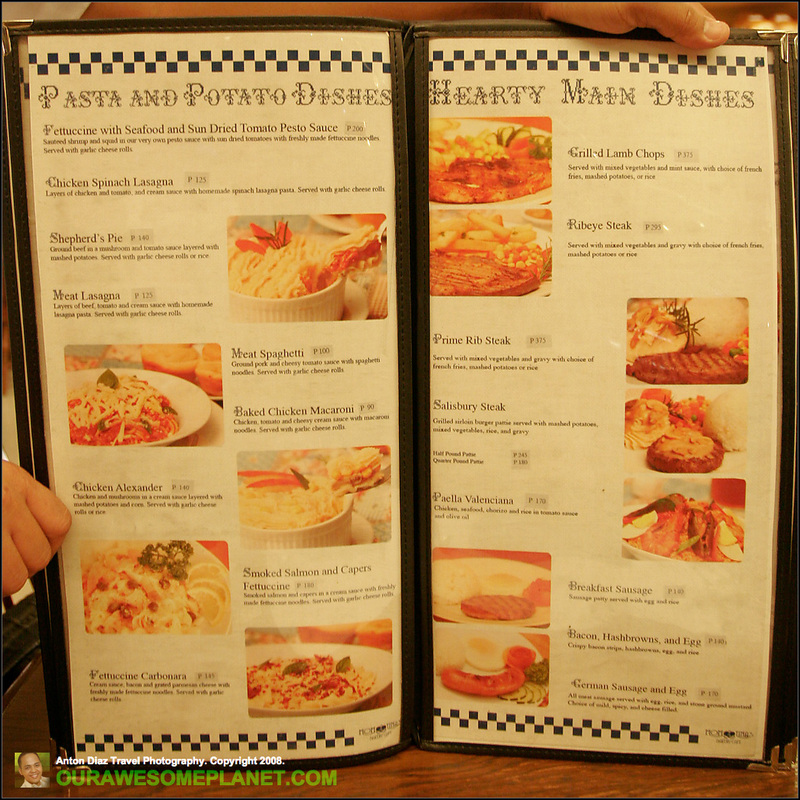 It is often difficult to find a good restaurant open during weekends in Makati. 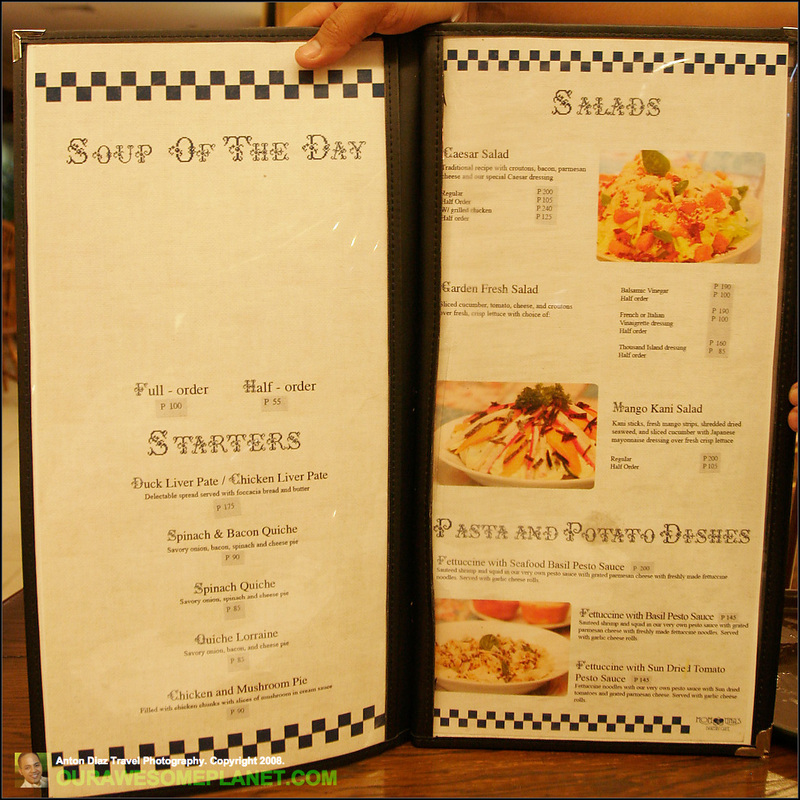 Soup of the Day, Starters, Salads, Pasta & Tomato Dishes. Chicken Spinach Lasagna (P125). Layers of chicken and tomato and cream sauce with homemade spinach lasagna pasta. Served with Garlic Cheese rolls. If you don’t know what to order, just give this rich lasagna a try. You would savor the thick cream sauce in every bite. The garlic cheese roll is crunchy and shape like a flower you can peel one layer at a time. Next time, I’m coming back for Paella Valenciana (P170), Chicken Relleno (P160), and Lengua con Setas (P295). I heard they are great from other foodies and the price is quite reasonable. According to Marbee Go of Wedding Essentials and Manila Bulletin Travel, this is the best Oreo Cheesecake in town. We have to agree and this is a must try! The name Cucina Gayuma intrigued us for some time now. We were hoping to try it sooner but it was closed on a Monday when we visited the area. Gayuma is a filipino term for love potion or food that will make you fall in love with a person. In a sense, the Gayuma term is misleading because the food is actually experimental meals on Filipino fusion. Gayuma is used to refer to food that seduces your senses. I remember that there was a Gayuma restaurant before (in Katipunan?) but this one is not related to it. Laing Pasta (P190). Taro Leaves, coconut milk and cream topped with smoked fish and crumbled white cheese. The Laing Pasta of Cucina Gayuma is getting a buzz in the foodie community. It is the best and if you have only one dish to try this is it. We love laing made from gabi leaves and authentically made in Bicol. It is a little bit creamy and the laing taste blended well with the pasta. So far, Delifrance is the best food available in NAIA Terminal 3. A sandwich would cost anywhere from Php 120-Php 240. We would order it to go and bring it to the airplane with us. Yes, you can eat on the airplane as long as the tray tables are stowed during take off. Finally, I’m happy that we have a world class airport for our Cebu Pacific and PAL Express flights. Just another tip, Philippine Air Line EXPRESS terminal is in NAIA Terminal 3 and not in NAIA Terminal 2. I made a mistake last Friday of assuming all Philippine Air Line flights are in NAIA terminal 2. My brother Rommel dropped us off in Terminal 2 and found out that we are in the wrong terminal. I’m glad that we had enough time (45mins before the flight) to transfer from T2 to T3 and catch the PAL Express flight to Busuanga. Did you make the same mistake before?